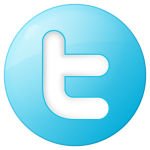 If you have noticed, many of my blogs I talk about the food we eat and the wine will have with the meal. Wine and food both bring pleasure and go so well with each other. Of course there is nothing wrong with a glass or two of wine on its own, as I do frequently, but I feel food can really enhance the wine. 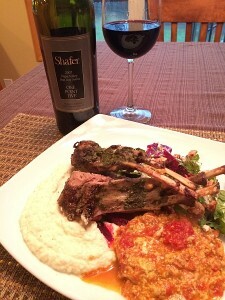 The last seven days of April had called for rain in the forecast, which led me to request a satisfying roasted rack of lamb! I chose a 2007 Schafer One Point Five that paired perfectly! Chris also prepared cauliflower and mashed potatoes with white truffle oil, eggplant and ricotta, mozzarella stew with homemade red sauce, and a warm beat and arugula salad. Delicious! Deep color depth and a purple hue. There was sediments in the final glass. The red wine’s aromas were moderate and I had to swirl my glass. The development was young-fruity but I noted spice, minerals, dark fruit, cocoa, and dark chocolate. 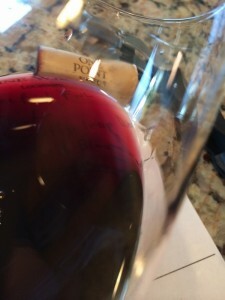 This wine was dry, full-bodied and the acidity was lively. Even though the wine was astringent the tannins were medium. Tasting the wine I had a soft silky mouth feel and a long finish. Region/Appellation: Stags Leap District, Napa Valley. 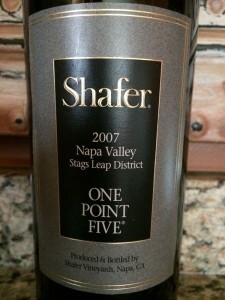 I rated the 2007 Shafer One Point Five four glasses. With every drink, Chris hummed and said she really enjoyed this wine. She keeps saying for the most part, all 2007’s are great!